Writers want to stay in touch with their readers. Sending bulk SMS is a great tool to have in your toolbelt. Let’s build a WordPress plugin in PHP so you can send text messages to readers about topics they care about. Plugins let you extend and add functionality to your WordPress site. Since we are adding an entirely new function to WordPress, we have to use a plugin to achieve this. First, we need to install WordPress if you haven’t already. You can download and install one locally by following the installation instructions here. I have my WordPress installation path as localhost/sendex/. I’ll be using it as my reference all throughout this tutorial. 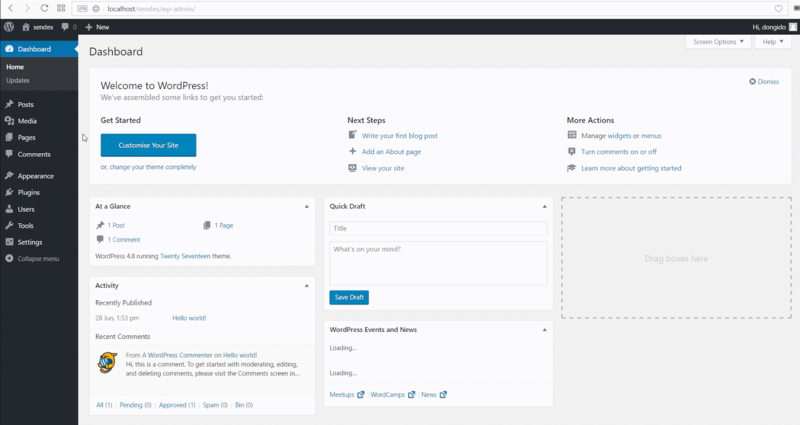 Once you are done with the installation, log into your WordPress admin dashboard. This is where we will be working from now on. The admin dashboard should be localhost/sendex/wp-admin assuming you used the same installation path that I used. Assuming your installation path is http://example.com/, you can get the admin dashboard by opening http://example.com/wp-admin in your browser. Log in with your username and password. If the login was successful, you’re ready to go. The best way to begin with a new plugin is by working on the incredibly useful WordPress Plugin Boilerplate. You might be asking why are we using a boilerplate instead of building from scratch. This boilerplate will get you started quickly with a standardized, organized and object-oriented foundation – basically, everything you want if you started from scratch. You can fill in whatever you want in the fields above. I’d suggest you use the same details I entered. This will make it easier to follow along with the code. You can change the details later once you fully understand the code. After downloading the boilerplate above, extract it into your WordPress plugin folder i.e. localhost/sendex/wp-content/plugins. Once you’re done, go to the admin plugin page localhost/sendex/wp-admin. If you are logged in, you should see our new plugin in the list of plugins. Activate the plugin by clicking on the activate link. Now that our plugin is installed, let’s review our boilerplate folder structure. When you open the plugin folder sendex, you will notice that the plugin has 4 folders: admin, includes, languages, public and some other files. This folder contains all our admin facing code; including css, js, partials folders and a php file class-sendex-admin.php. This folder which is a ready to use .pot file to make your plugin in multiple languages. The public folder is the similar files as our admin folder except that all codes here are for public facing functionalities. README.txt: This will include your plugin name, compatibility version, and description as seen on the plugin page in the WordPress repository. This is the first file we will edit. uninstall.php: This script is called when the user clicks on the Delete link in the WordPress plugin backend. sendex.php: This is the main plugin bootstrap file. You will likely edit this file with the version number and the short description of your plugin. We’ll need to add the settings page to our admin panel so we can manage our API credentials easily. * Add a settings page for this plugin to the Settings menu. The add_sendex_admin_setting function calls WordPress core function add_options_page which is used to add settings pages as you can be see here. The add_options_page function is a WordPress core function which is used to add new option pages. We are utilizing this to create our own settings page. The add_options_page function accepts 5 parameters. page title: text to be displayed in the title tags of the page when the menu is selected). The display_sendex_settings_page renders the settings view page. The view file can be found in the admin/partials/ folder. Next, create the settings page by copying and saving the below code to a admin/partials/sendex-admin-displays.php file. The settings_fields function prints out the settings fields for our settings section. By default, this will print out all the settings options WordPress has. We will define our own later so it only prints our defined options. do_settings_sections function will print out all settings sections that we will add to our settings page. submit_button prints out the submit button. You can read more about how all of this works here. Next, let’s register the settings options and fields that we need. Add the below code to admin/class-sendex-admin.php. * Registers and Defines the necessary fields we need. * Sanitises all input fields. The comments throughout the code explain what each function handles. register_settings function registers a setting and its sanitization callback. This is part of the Settings API, which allows us to automatically generate wp-admin settings pages by registering our settings and using a few callbacks to control the output. add_settings_section helps us group common input fields. add_settings_field function prints the html input field to the page. We need to hook these functions to WordPress so WordPress knows about them. Open up the includes/class-sendex.php then add the below code to the define_admin_hooks function. The function should now look like this. When you refresh the admin page, you should see the Settings page..
Add a page for sending messages. We need to add a page where we can send our SMS from. First, we will add a submenu to the tools tab in the admin area. Add these functions to the admin/class-sendex-admin.php file. * Register the sms page for the admin area. // Create our settings page as a submenu page. * Display the sms page - The page we are going to be sending message from. The add_submenu_page function adds a new page under the tools tab. For further reference, take a look at this reference page. 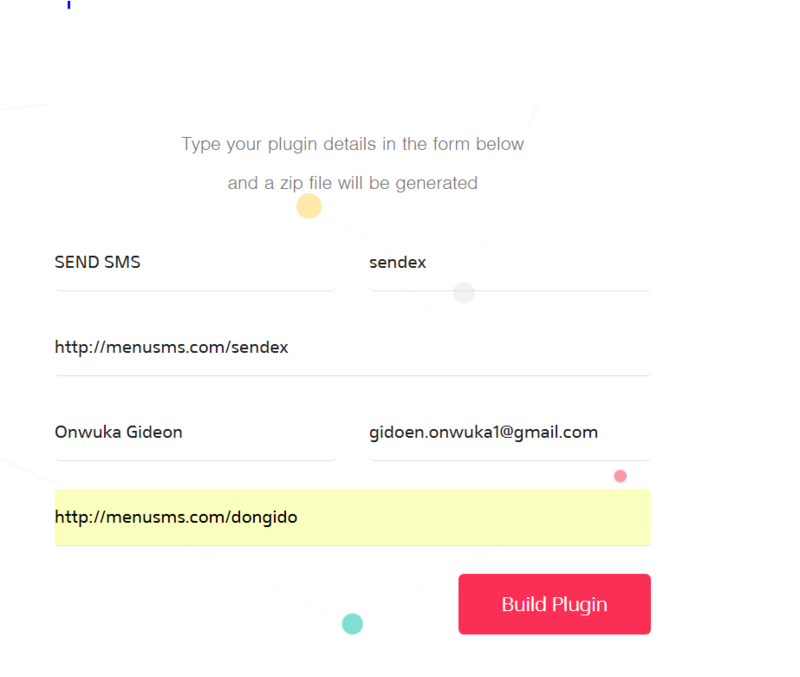 The display_sendex_sms_page function includes our HTML forms for sending sms. One more thing, let’s add the hook. Open the includes/class-sendex.php file then add the below inside the define_admin_hooks method. Now, create a new file inside admin/partials/ folder and name it sendex-admin-sms.php. If you refresh the admin page, you should see our new submenu under the tools tab. If you click it, it should lead to a blank page though. Next, add the content below to the file you just created: sendex-admin-sms.php. If you click SENDEX which is under the tools tab, you should see our new page. Let’s add the logic that will send our SMS. Maybe you’ve noticed, our form action attribute is empty, so this basically means we are submitting to the same URL. We will add a function that checks if our form is submitted then it processes the data. Create the function that will process the send SMS form. Add it to class-sendex-admin.php. //gets our api details from the database. What this function does is to check if a REQUEST has a $_POST['send_sms_message'], then it tries to send the SMS. The try block is for exception handling. It tries to send messages, if there’s no error, it displays a success message. If there is any error, it displays a failure message. We called new Client(), self::DisplayError(), self::DisplaySuccess() which we have not defined anywhere. Let’s add those functions too. The admin_notice function outputs HTML which will contain our error or success messages. DisplayError function calls the admin_notice to display an error message. DisplaySuccess function calls the admin_notice to display an success message. 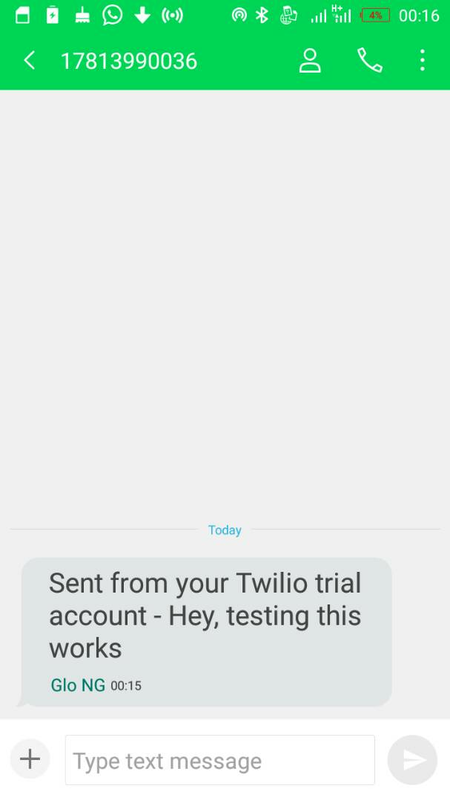 Now download twilio library and extract it into your plugins folder (sendex). The folder name might be twilio-php-master. To make things simple rename the folder to twilio. Now open admin/class-sendex-admin.php then add the below at the top of the file. Here is what your file should look like. * The admin-specific functionality of the plugin. * The ID of this plugin. * @var      string    $plugin_name    The ID of this plugin. Finally, add a hook for sending message to includes/class-sendex.php. As usual, add it to the define_admin_hooks function. // calls sending function whenever we try sending messages. Now open SENDEX under the tools tab and try sending messages. Yay! Congrats, you just sent message from your WordPress site. In this tutorial, we learned how to get started building WordPress plugins from a boilerplate code builder, create settings pages in WordPress and to send bulk SMS in WordPress. I hope you enjoyed this tutorial. Thanks for reading. If you have any questions regarding this post or on WordPress, feel free to reach out, cheers!